personal touch, we are here for you. 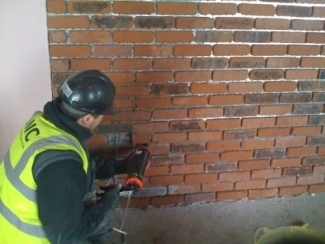 We are able to undertake all Plastering jobs, from small residential plastering work to stunning industrial Plastering and more. We offer a professional service for the laying of tiles, slabs and mosaics. As a long-established business, we provide a high standard of workmanship, offer quality materials and reasonable prices. Our trained specialists use the latest techniques to put your request into effect exactly the way you envisioned it. Although the damaged wall may look catastrophic, it isn't as hard to repair as it looks. Depending on the size of the damage, you may also need some extra plasterboard to fill in the gap. we can fill it in with plasterboard before applying filler. We provide a Nationwide Service, Industrial and Commercial from Houses Schools, Restaurants, Offices, Pubs and Factories . Just Call us for your Quote ! We can supply and fit all of our products / Services or just Fit.